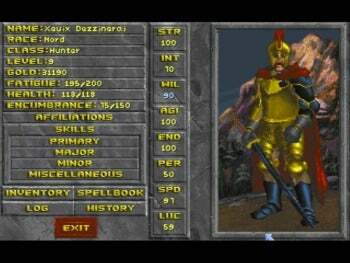 Itching to play the classic role-playing game, The Elder Scrolls II: Daggerfall? Here's how to get it running on a Windows 7 PC. First, you need to find the game itself. Having an original copy of the game is ideal (it was first released in 1996), but you can now download Daggerfall via PCWorld's Downloads library; publisher Bethesda Softworks has released the title for free to celebrate the game’s 15th anniversary. You’ll need to use the free DOS emulator DOSBox to play the game on a modern machine. Grab the latest version of DOSBox (0.74 as of this writing) and install it to your hard drive. Remember that any filename over eight characters will truncate to match the old DOS 8.3 naming conventions, so make sure to create a separate folder for housing your DOS game files with a short and simple name, such as C:\DOS. After downloading a copy of Daggerfall, unzip it in a subdirectory of C:\DOS, such as C:\DOS\DaggerCD. DOSBox offers advanced users a variety of config settings to tweak, but we're going to keep it simple and show you the bare minimum you need to play Daggerfall on a Windows 7 machine. (Experienced tweakers can dive into the DOSBox forums or community wiki for more tips.) To get started, select the Edit Options item in the DOSBox folder on your Start menu. This action will open the dosbox-0.74.conf configuration file, where you can tinker with the variables of the emulated DOS environment. Scroll down to the [dosbox] section and change the 'memsize' variable to read memsize=32. Save and close the file, and then launch DOSBox in windowed mode from the Start menu; you’ll find yourself staring at a basic DOS command prompt like 'Z:\>', so you’ll need to tell the emulator where to look for your Daggerfall files. This process is called mounting a virtual drive, and you can easily accomplish it by typing mount c c:\dos -freesize 1000 and pressing Enter. Next, you need to emulate a virtual CD-ROM drive from which to install your copy of Daggerfall. Type mount d c:\dos\daggercd -t cdrom -label Daggerfall to do so. This line tells the emulator to treat all the files in c:\dos\dagger as though they were stored on a physical CD labeled Daggerfall, without all the hassle of actually needing to find a working Daggerfall CD. Now switch your DOSBox emulator to the D:\ drive by typing d: and pressing Enter, and then type install. This will initiate the Daggerfall install program; agree to all terms, and install the game to C:\Dagger on your hard drive, making sure to set the install size to Huge. When the installation program attempts to configure your sound card, make sure you aren’t running DOSBox in full screen, as that will cause an error in the program (you can press Alt-Enter to switch to Windowed mode). DOSBox emulates the software suite of a Sound Blaster sound card, so instruct the Daggerfall installer to auto-detect, and choose the Sound Blaster 16 option. Set the default MIDI Port to 388, save the configuration, and finish the installation process. Once the game is installed, type dag123 at the 'C:\DAGGER' command line to run the patch utility. Patch Daggerfall to version 1.07, and then launch the game by typing dagger at the 'C:\DAGGER\' command line in DOSBox.